I don’t know about you but I love a good personality test. Meyers Briggs,AEM Cube, Strengths Finder … you name it – put me in a box and pigeon hole me! I know most people crave uniqueness and individuality, but personally, I love being reminded that there are other people out there like me. This got me thinking about nail shapes – does someone’s file style reflect their personality? There’s no such thing as the perfect nail shape – ultimately it’s all down to taste. So, what are the options? Oval – this shape is achieved by filing the nail into an egg-shape. It’s necessary to take off quite a bit of the sides of the nails, which can weaken them in the long run. It is also dependent on the nail being long enough to attain the desired shape. It is good for people who have quite wide nails as it makes them appear more feminine. Square – this shape is formed by allowing the nail to grow out and then filing across the tip of the nail, perpendicular to the nail length, while maintaining straight edges at the sides. It looks good on long nails but can accentuate the bluntness of short nails. 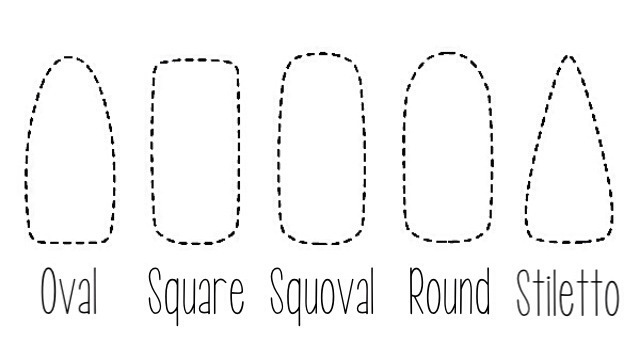 Squoval – this shape is a combination of the square and the oval and is achieved by filing a straight tip and then softening off the corners. It gives a feminine look and is great for both long and short nails. It is also hard-wearing and good if you are trying to grow your nails out because the sides aren’t thinned and weakened. Round – this shape is created by filing the tip into a circle shape that runs parallel to the shape of the white moon at the base of the nail (otherwise called the lunula, in case you were interested!). It is perfect if you like to keep your nails short. Stiletto – this shape, sometimes called mountain peak or pointed, is not advised for natural nails as it would weaken the nail completely. The sides are filed away so that the nail forms a long point at the centre. Think Lady Gaga! Almond – this is a less drastic version of the stiletto shape made by filing the sides of the nail to form a soft, shallow point at the centre. It can be achieved on natural nails but ultimately weakens the nail and prevents them from growing very long. Straight-edged circle – this shape is similar to the square shape in that the edges are straight, but rather than the tip being a straight line, it forms a semicircle. It provides strength and support for the nail, much like the squoval shape, and is good for growing out nails. Edge – this shape has straight edges like the square shape, but the tip forms a point at the centre. It is good for adding drama and can work on long or short nails. If the tip is broken, it can easily be filed into a squoval or round shape. Oblique – this shape is achieved by having straight edges but filing the tip at a slant so that it creates a point that is off centre. It is not very practical and wouldn’t be advised for a long-term shape but if you were transitioning from long to short, it could be an option to trial before filing your nails down. So which nail shape are you sporting and does it reflect your personality?